ESENET is an Ethernet gateway specifically designed to interface Woodward's Easygen series genset controls with Modbus/TCP networks. It interfaces via the load sharing CAN bus with the Woodward controls. The ESENET offers cost savings compared to traditional Modbus/TCP to RTU gateways as no separate RS-485 wiring is required. In addition the ESENET takes advantage of the multi-master capability and fast transmission speed of CAN to offer short Modbus/TCP poll cycles as well as concurrent access. Both cannot be achieved using conventional serial Modbus half-duplex data transfers. 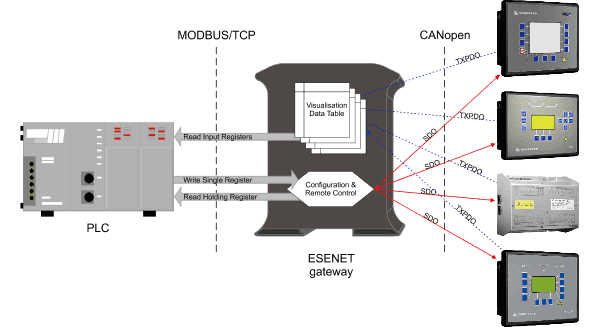 A single ESENET added to the CAN network will make all Visualisation Data of connected Woodward CANopen controls available without adding additional load to the CAN bus communication. In addition concurrent and fast read and write access to device Parameter IDs is possible utilising parallel CANopen SDO transfers. Usage and configuration of the gateway is simple and conveniently performed using a web browser which connects to the embedded web server.